South Carolina's traitorous and soon to be retired Senator was caught this past week doing what he does best - betraying the people of South Carolina while doing everything he can to help and assist the Obama regime and their Marxist agenda. With Obama's obliteration of America's military strength, particularly the size of the Army, Secretary of State John Kerry had just finished testifying on an Obama proposal to turn unused Department of Defense funds over to the International Monetary Fund which would provide aid to Ukraine. 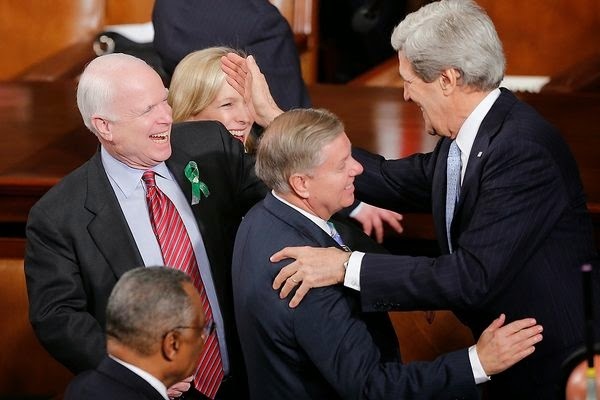 As seen in the video below, Kerry had no sooner finished speaking when Grahamnesty was offering his praise and offer to help with those pesky Republicans - you know, the people who think that unneeded government funds should be left in the pockets of those who worked for them. Given all the help Lindsey has provided Barack Hussein Obama, John Kerry, Bill and Hillary Clinton and Chuck Schumer, among others, we think they should all come to South Carolina and campaign for their boy who has carried so much water for them and their kind. We are confident that when all is said and done, the people of South Carolina will choose a man of public service, principle and honor to replace America's worst Senator.